Sean Scully is extremely widely known as a painter. Indeed, I might go so far as to say that he is as widely known as any contemporary painter now living, with recent major touring shows in China, and a major show earlier this year at the Marble Palace (State Russian Museum) in St Petersburg. He is a bit less widely known as a sculptor, though his reputation in this field of endeavour is fast catching up. 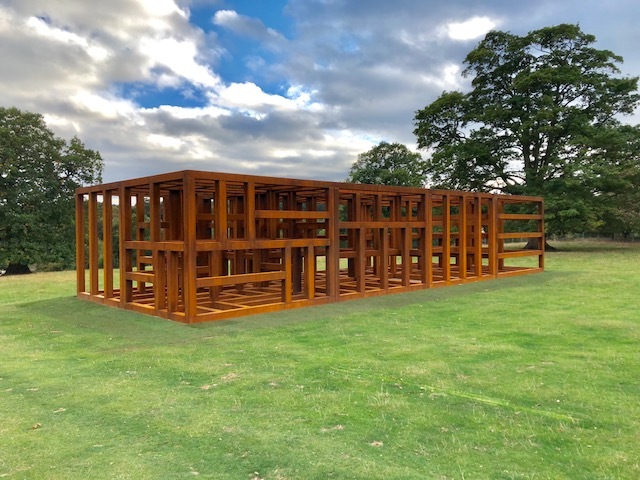 His new exhibition at the Yorkshire Sculpture Park, entitled Inside Outside, is clearly intended to focus our attention on this aspect of his production. 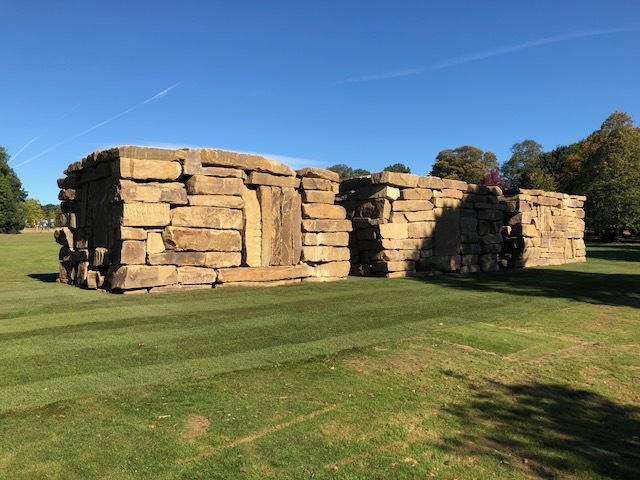 No site in Britain is better adapted to showing very large sculptures, and some of these, shown in the open air, are huge. One, entitled Wall Dale Cubed, measures overall 4 metres by 24 metres by 6 metres and comes in three sections. It has been inspired, as a set of photos in a nearby gallery tells one, by stone walls on the Isle of Aran. Another huge sculpture, made of Corten steel, not stone, is nearly as big. It is 19.2 metres long. As often with Scully’s work, there are several ways in which these behemoths can be read. The steel sculpture, Crate of Air, is, as the artist points out, intrinsically a kind of vast musical notation. A point which he dominated as the press view I attended by drumming on it with his fists, to immediate musical effect. The sounds produced were indeed so harmonious that I couldn’t resist telling him that the next stage ought to be a video, a field into which he hasn’t yet ventured – that is if I remember correctly. Wall Dale Cubed has its origins in the landscape. That is, it isn’t really an abstract work at all, but a kind of surrogate in stone and in three dimensions for the late landscape paintings of J MW Turner. This is even more obviously true of most of the paintings shown in conjunction with the sculptures. Essentially they consist of freely painted horizontal bands of colour, oil on aluminium panels. The titles give the intention away at once. One is called Landline Field. Another is Landline Inwards. Both invite you to go further and further into the picture plane, in pursuit of an ever-receding horizon. In each case it seems uncertain whether you are looking at a vast plain, or outwards from some deserted beach, just as the sun has left the sea, but before the moon starts to hover over it. This sophisticated ambiguity is one of the reasons why Scully has been successful in reaching a global audience, crossing cultural boundaries as he does so. For example, his work in as intelligible in the context of Far Eastern ink painting, say of the Song Dynasty in China, as it is in that of an English Romantic such as Turner. Or, indeed, if you happen to know something about Russian 19th-century art, there is a comparison to be made with the seascapes of Ivan Aivazovsky (18117-1900). Increasingly Post Modern art is in thrall to previous information. You have to know something, quite often something rather obscure and confined to your own little cultural nexus, before you get it, With Scully, you don’t have to do that, All you have to do is to look. 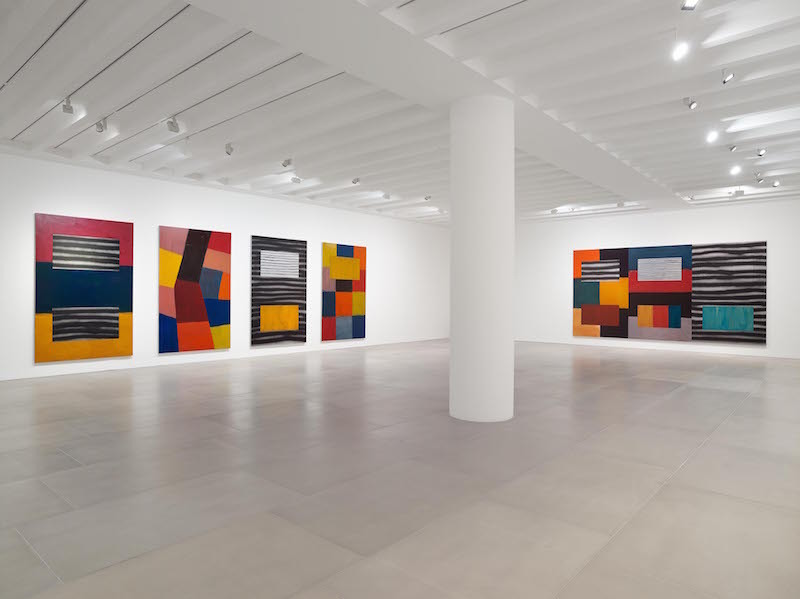 In addition to his current show at the Yorkshire Sculpture Park, Sean Scully now has a solo exhibition at Blain Southern in Hanover Square. It is interesting to note some subtle differences of emphasis between the two. The exhibition in London has one of his stacked sculptures. Obviously, there isn’t room for more. If memory serves, this piece is somewhat brighter in colour than the equivalents I saw in Yorkshire – even those that were indoors. There are some middling large paintings, with horizontal bands of colour, again much like some I saw in Yorkshire. And there are some very large, ambitious works. These demonstrate his characteristic self-confidence and command of major scale. 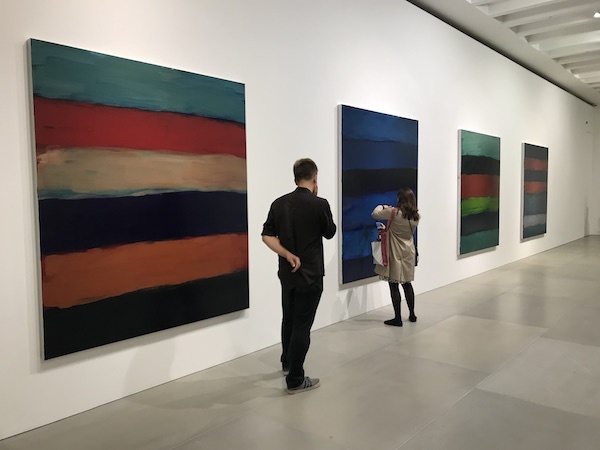 The interesting thing about these very big paintings is that the hints at figurative reference that appear in the works that are composed of horizontal bands have, in these overscale compositions pretty much disappeared. In one case – a composition made up irregular rectangles, you might just possibly, perhaps, think of yourself as being in an aircraft, flying over agricultural land. The painted surface bends away from you. In others, no such reference exists. There is no illusion of perspective, though there is sometimes one of depth – some rectangles detach themselves from the surface and seem to flat in front of the picture plane. If there is a figurative reference here, you have to search hard to find it. The clue, perhaps, might be the notion that, in a subtle way these compositions refer to the sister art of architecture. These paintings are buildings, in more than one sense, created for inspection by the mind. Your mind, as you stop to look.